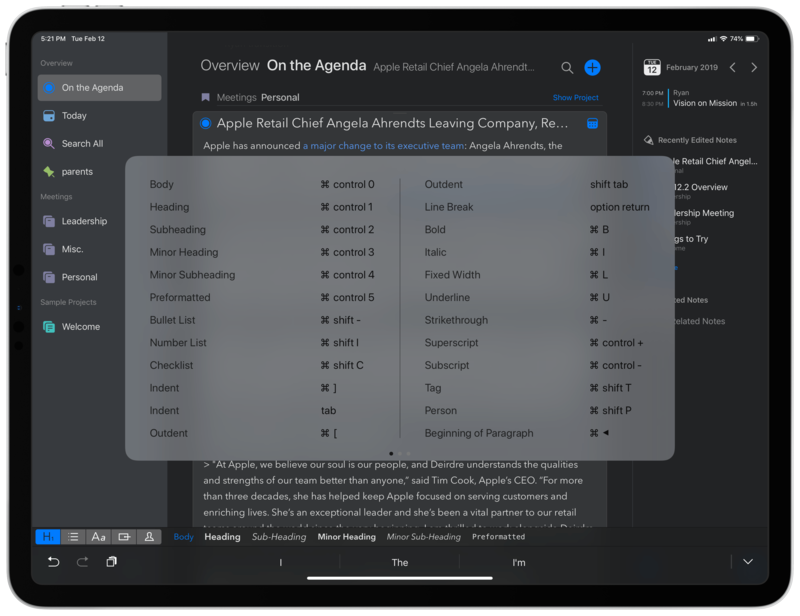 Agenda recently passed the milestone of its first full year in public release, with the Mac version debuting last January and the iOS app a few months later. The team behind Agenda has been keeping busy ever since, with improvements like Siri shortcuts, dark mode, accent colors, and most recently, images and file attachments. Today's update to version 5.0 on iOS and the Mac is relatively minor by comparison, but it still offers a few valuable additions. There are new options for your text environment, like the ability to set a custom line spacing and use an extra small text size, plus you can now perform multi-tag and multi-person searches. The improvement that stands out most, however, is Agenda's newly expanded support for external keyboards on iPad. When we published our MacStories Selects awards for 2018, Agenda was our pick for App Debut of the Year. Its strong 1.0 followed by a string of noteworthy updates made it an easy choice. In a separate Selects category, Best App Update, we recognized Things 3.6 because of its unparalleled support for external keyboards. I'm happy to report that with today's update Agenda has taken a page from Things' book and made much of its interface accessible without lifting your fingers from the keyboard. Open Agenda 5 on the iPad with a connected keyboard and you can immediately start navigating the app with the arrow keys. The primary sidebar – where your On the Agenda and Today screens live, along with your list of areas, projects, and saved searches – supports up and down arrow inputs, and you can move from there to the right to enter your note lists. When you've highlighted the note you want to edit, pressing Return will activate editing mode on the title line, with a second Return press moving your cursor into the body of your note. When you're done writing, ⌘` exits editing mode and brings you back to navigation mode. Being able to navigate Agenda's interface, moving between sidebar and notes seamlessly using only the keyboard, is a nice improvement over many other apps, which tend to require at least a tap or two on-screen every time you want to switch "modes" in the app, such as moving between an editor and a note list. Apple Notes is another example of keyboard support done well in this area. Where Agenda surpasses even a solid app like Apple Notes though is in the sheer number of keyboard shortcuts it provides. Only a sampling of the shortcuts Agenda provides. There are so many shortcuts available now that, once you learn them all, you'll be able to keep your fingers far more often where they belong in a writing app: on the keyboard. Despite all the positive ways Agenda's keyboard support has expanded, there remain a few glaring oversights in keyboard navigation that keep the app from providing the same level of experience as Things 3. For example, you can't add images or other file attachments to a note without touching the screen, nor can you navigate through search results using the keyboard, a limitation that extends to several other sub-menus that pop up when doing things like creating a new note or navigating a project's table of contents. Agenda has most of the basics covered, but that makes it all the more painful when you run up against an area where the app seemingly forgets the keyboard exists. Hopefully those areas will be addressed in a future update. If you haven't yet checked out 2018's MacStories Selects App Debut of the Year, now's as good a time as any – especially if you use an iPad. Agenda is a strong, unique take on the note-taking genre, and there are few modern productivity apps receiving the same level of strong development work as this. Agenda 5 is available on iOS and the Mac.